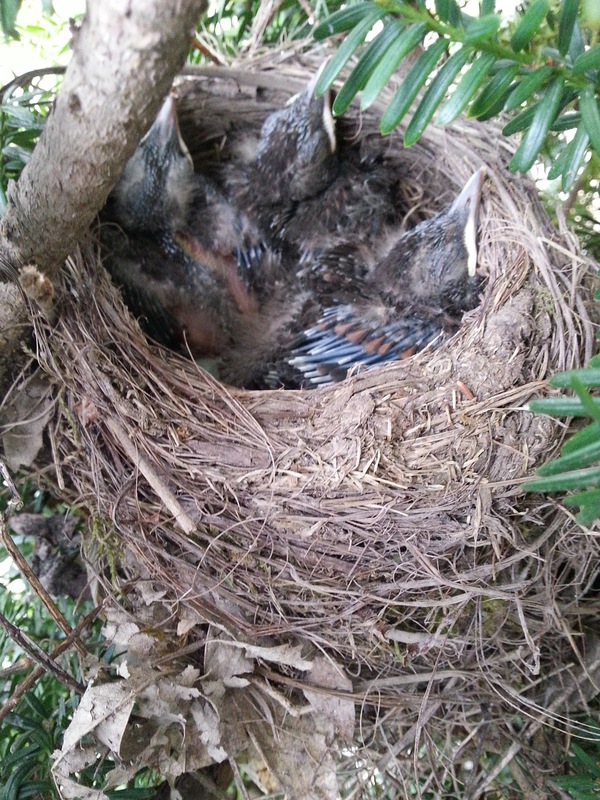 It seams that a Common Blackbird decided that the bush next to my front door would be a nice place to have her baby's. They where so cute. Over the following week mom and dad brought lots of bugs. We spent a few days out working on the bee hives in the carport near the bush. It was funny because while we where there dad simply wouldn't go in and feed the baby's while we watched. We had to turn our backs then dad would fly right in to the nest and feed the baby's. The bad thing about the nest being here was that when the baby's flew off they ended up in my neighbors yard, she has a dog. The dog found the baby's in the garden and they got scared tried to go back to the nest. One ended up flying into the garage and it took me 15 minutes to find it under all the boxes and stuff in there. The other ended up flying into the house when the front door was open. I relocated baby birds to my garden where dad and mom quickly came and yelled at me for walking around with there baby's. Over the next few weeks I could see mom and dad teaching the baby's how to find juicy worms in my lawn. I love having baby blackbirds every year.